For some 2,000 years the island was ruled by a local kingdom. In 1517 the Portuguese founded a fort at the port city of Colombo and gradually extended their control over the coastal areas. In 1638 the Dutch made a treaty with Rajasinghe II, the king of Kandy, to get rid of the Portuguese. By 1660 the Dutch controlled the whole island except the kingdom of Kandy and it was not until 1656 that Colombo fell. In 1796 Great Britain occupied the coastal areas of the island (which they called Ceylon). In 1802 the Netherlands ceded the parts of the island they still occupied to Great Britain. The remainder of the island, the Kingdom of Kandy, was occupied by Great Britain in 1815 and the native king of Kandy was deposed and exiled. 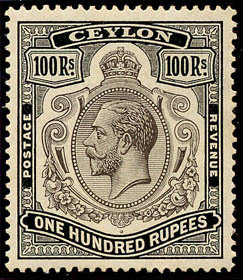 Ceylon became an independent country on 4 February 1948. 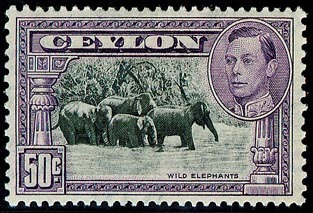 On 22 May 1972 the name Ceylon was changed to Sri Lanka. In 1798 the Dutch opened five post offices in the districts under their control. In 1799, they published the first postal regulations and postage rates. The Dutch East India Company operated the Postal service, which was not meant for the public but for official use. The first postmaster was appointed in 1802 and handstamps were first supplied in 1813. 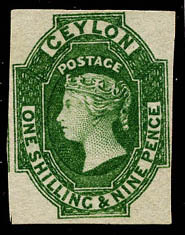 For collectors of postage stamps, postal history, postal stationery and postcards from Ceylon/Sri Lanka. Publishing the Ceylon Study Circle Bulletin and specialist books. This is a postal stationery exhibit of Ceylon Airgraphs used by forces in Ceylon during World War II. A study of the introduction and use of the letter and numeral cancellations for the period from 1857 until 1892. The post offices that were allocated these cancellations are listed with opening dates including those that were re-allocated. 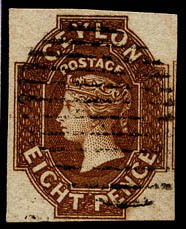 The history of the well known Colombo company of Cave & Co is linked with the philatelic material that it produced. From the handstruck name overprints on stamps to perfins; postcards; printed stationery and material connected to the Boer War camps primarily at Diyatalawa. These surcharged stamps were in use for a short time, their purpose, printing and the varieties that were produced are explained. All known types are fully illustrated in colour and forgeries are also included. This study explains the working of the postal services and the postages prepaid or charged and to list the handstruck markings found on the mails. It covers the period from 1795 at the end of the Dutch occupation and the beginning of the British who established a postal service for the Island.